People with learning disabilities are highly likely to have vision problems, but many are never diagnosed. We look at an innovative project which is tackling this. Vision problems are surprisingly common among people with learning disabilities. The estimates suggest that in the UK today around 96,500 adults with learning disabilities (including 42,000 known to the statutory services) are blind or partially sighted. Six in 10 people with learning disabilities need glasses – and though this sight loss is less serious, they may not have glasses and/or the support to get used to them. 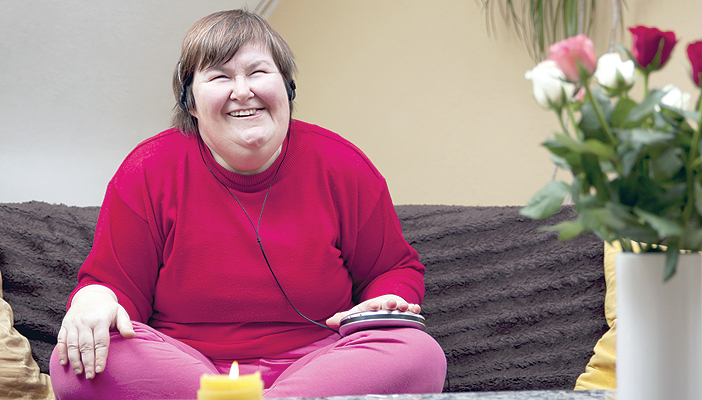 It is undeniably harder to diagnose sight problems in many people with learning disabilities. Someone with communication problems will find it hard to explain that they cannot see. Distressed and/or challenging behaviour because someone cannot see is easily misinterpreted. Adults, children and families all find attending eye clinics – with an unfamiliar environment and often a long wait too – difficult. But there are also assumptions about what people need sight for ­– and that for some people it just isn’t that important. “Staff just don’t look for vision loss and so people aren’t necessarily getting eye tests, even,” says Martin Thomas of the charity SeeAbility. “People make assumptions on behalf of people with learning disabilities that they won’t wear glasses, or that they don’t need fine vision.” And importantly, orthoptist checks for reception age children are not mandatory in special schools. As a result, sight problems – from the correctable to the disabling – are going unnoticed, or only noticed at a point where they have resulted in considerable damage. However, several projects are tackling this. The Bradford Learning Disability Eye Service, which Pilling set up in 2011 and which won the Vision 2020 Astbury Awards in September 2015, is one of these. The adults’ service builds on, and extends, the existing screening programme. The community team identifies patients who have not had their eyes checked at the opticians, and they are seen first at the local learning disability centre. If there are any concerns, they’re referred directly into the specialist learning disability hospital eye clinic, which liaises with carers, provides accessible information and generally aims to make the whole process as user-friendly as possible. Of the 286 children attending special needs schools in Bradford, 199 were not known to hospital eye services and were assessed under the programme; 42 were referred into the hospital eye service; and eight were identified as eligible for registration. “Previous models have not been able to do a visual assessment of between 12 and 15 per cent of children – we only had three in total,” Pilling says. The team is very clear that for a programme like this to work – on both adult and child levels - it’s essential to get carers, staff and teachers on board. “The input from the teaching and support staff is key,” Outhwaite insists. “You don’t know where to start with a youngster if you have no background in what parents and carers believe they can see, or their speech and language or other impairments. Even if it’s just from a brief conversation, it’s essential to have that picture.” “I’m setting up a way of working which involves having a school vision lead in each school and vision champions at each key stage – sometimes in each class,” adds QTVI Yvonne Smith. Pilling sees no problem with making something similar work elsewhere – although it doesn’t necessarily have to replicate the Bradford model if another would be more appropriate.